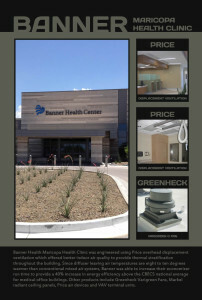 Banner Health Maricopa Health Clinic was engineered using Price overhead displacement ventilation which offered better indoor air quality to provide thermal stratification throughout the building. Since diffuser leaving air temperatures are eight to ten degrees warmer than conventional mixed air systems, Banner was able to increase their economizer run time to provide a 40% increase in energy efficiency above the CBECS national average for medical office buildings. Other products include Greenheck Varigreen Fans, Markel radiant ceiling panels, Price air devices and VAV terminal units.